I have nothing but the best things to say about my experience with Fundeliver.com and the finished product. From the start of this project, everything was handled professionally and expediently and I actually received my figurine 2 weeks early. The workmanship was impeccable - I was simply hoping for a close likeliness of the bride and groom but what I received was perfection. You will definitely get repeat business from me and I've already spread the word to so many of my friends and family to check your website out. Thank you again for your professionalism, expertise and impeccable workmanship. ps - I am attaching images that I would be more than happy to share. We absolutely love the way it came out, and the fine sense of detail you put into it. 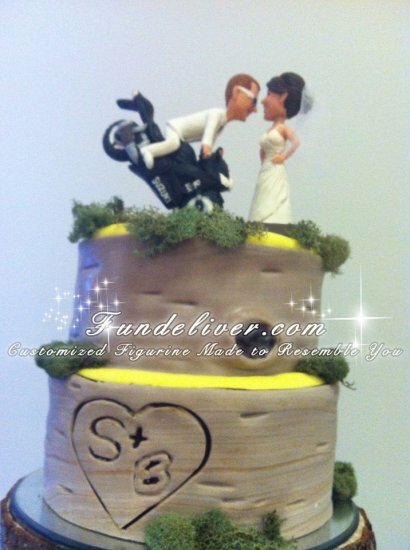 We received the cake topper the other day, and we unveiled it last night. We absolutely love the way it came out, and the fine sense of detail you put into it. We are really impressed with it, and we cant wait for everyone to see it at our wedding. It was packaged very securely and it came in a nice box. 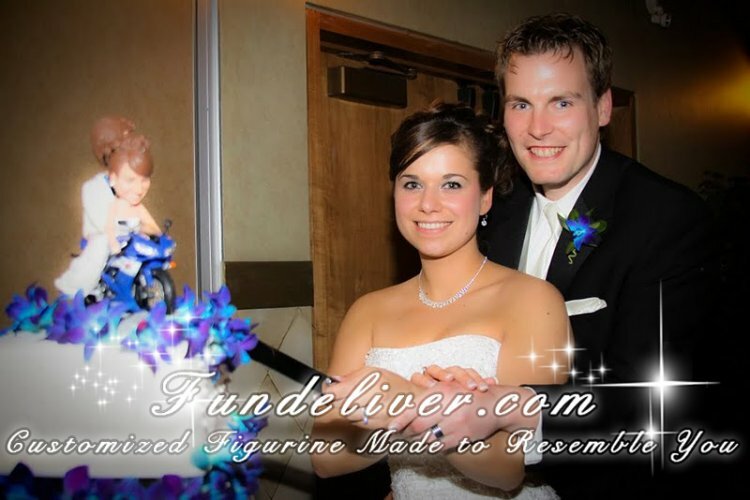 As far as my experience with FunDeliver, it was such a positive one. As far as my experience with FunDeliver, it was such a positive one. The pictures on the website help so much. I probably spent three hours on your site before I ordered my topper. You kept in touch with me on almost a daily basis. That really helped. The pictures of the progress were well-timed. It helped to have pictures at each step so I could ok things like the colors of the clay. I also appreciated the way you'd respond to the changes I wanted to make to the faces, the shape of the ears, etc. and then send more pictures to make sure the changes were fine. Your emails were always positive and reassuring - the wording was comforting. I was always excited to see an email come in from you. One recommendation I would make is to add notes during the ordering process about the bride's necklace. If it's something that must be in the sculpture to hide the neck line, the order form should say so. I didn't send pictures with me wearing a necklace and the sculptor added in a pearl necklace anyway. When I wanted it changed to a diamond solitaire, they added a heart shaped pendant that doesn't match what I will wear on my wedding day. That detail should have been cleared with me first. Another recommendation I would have is to expand your blond clay selection. There wasn't much to choose from between really yellow and practically gray. Another recommendation is to provide an approximate weight of a finished topper. This would help so the baker will know how to make a cake that will support the weight of the topper. My final recommendation would be to notify the buyer when the item has shipped and to provide a tracking number. Thanks so much, again, for this wonderful sculpture. I know my husband-to-be will be so surprised. Everyone who has seen pictures LOVES this item and I hope you get some referral business from me. 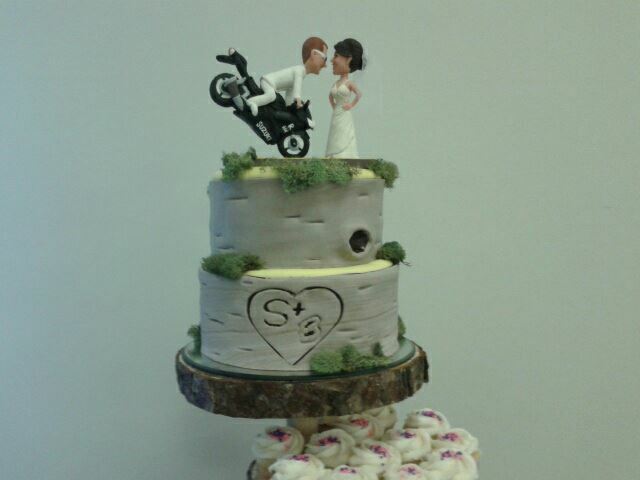 Everyone LOVED the cake topper! Hope you are doing well. 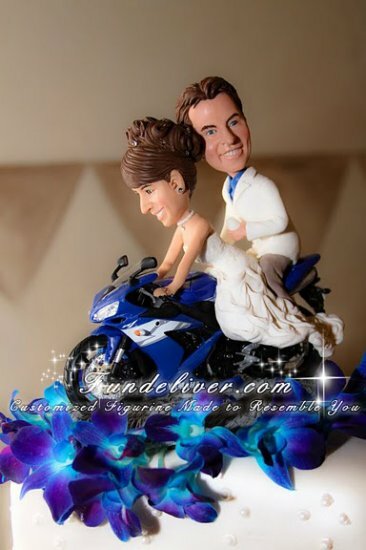 I wanted to let you know that everyone LOVED the cake topper! All our family and friends are talking about it! Thanks for making our one-of-a-kind motorcycle-mama and pharmacist topper! Here are the pictures I promised you! You can use them and my comments on the internet or for your portfolio if you wish. It will be such a hit at our wedding. 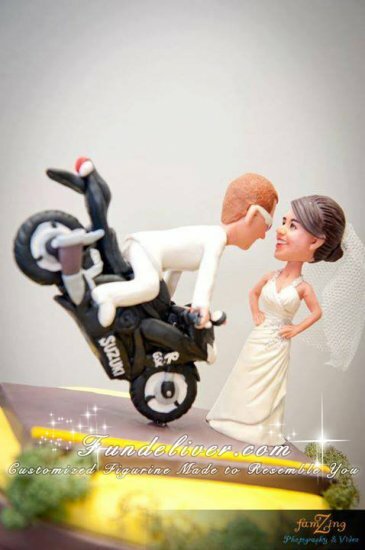 Just received the new cake topper. We love it! Thank you so much, it will be such a hit at our wedding. Thanks again and we will definatley recommend you to our friends. My husband and I LOVE our cake topper and given the amount of detail that goes into it, it came relatively quickly as well. 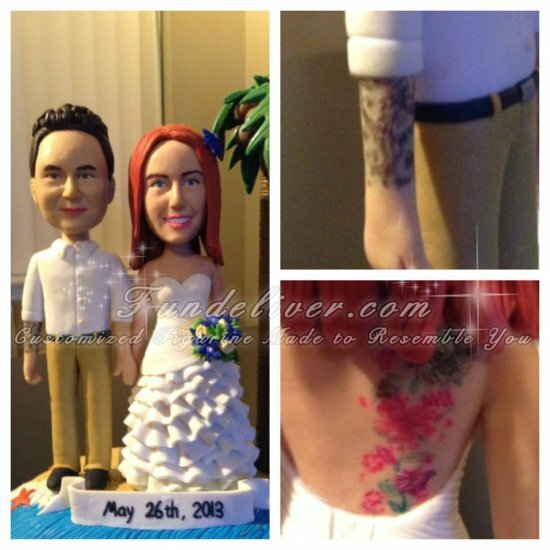 We absolutely loved the detail in the tattoos as well as the fact that they copied my dress perfectly. 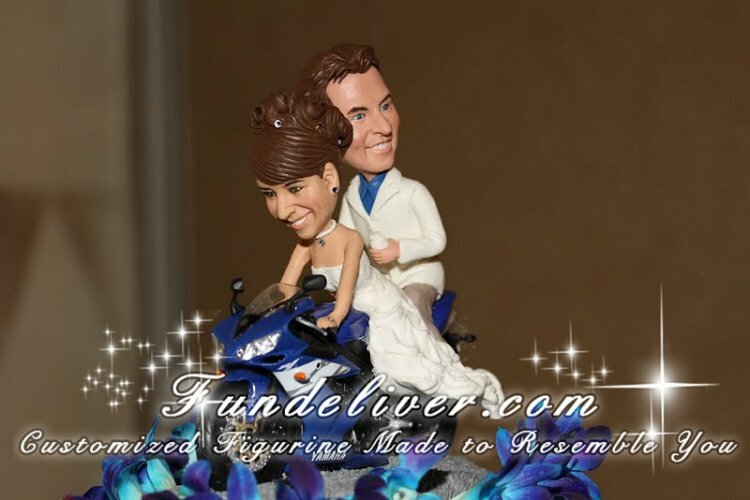 I would definitely recommend fundeliver if you're looking for a one of a kind cake topper that looks remarkably like you and it's something you can keep forever. 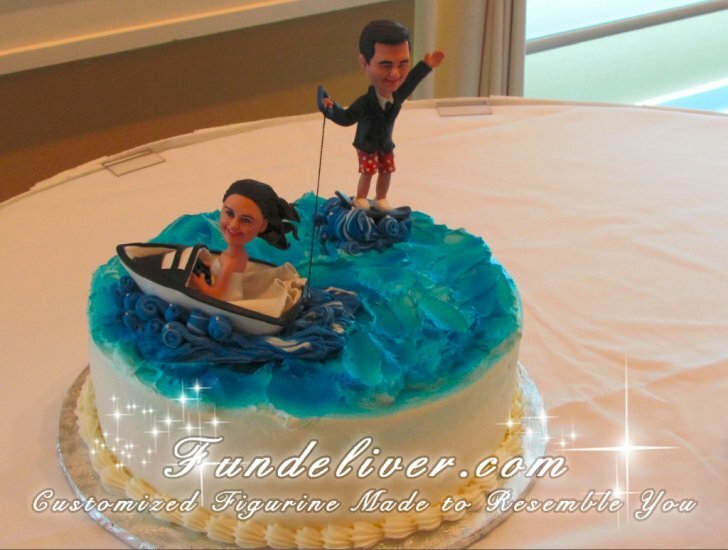 My husband and I love the water, he loves to wake board, so for our grooms cake I decided to surprise him with a wake boarding topper. Everyone loved it! It came in a lovely keepsake box which is nice to keep and it worked great for shipping as well, no cracks or anything. This company offers something different and unexpected and they are really good at what they do. 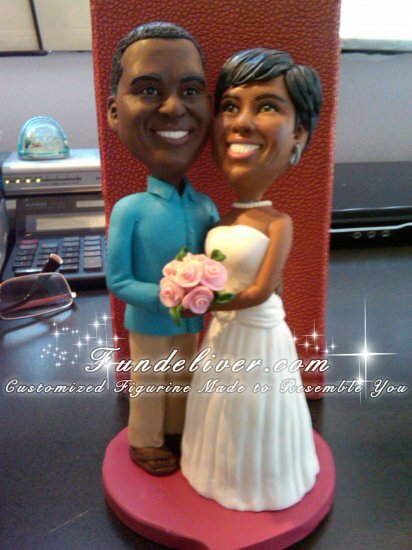 The toppers are a little pricey, but they are quality and one of a kind! I would highly reccomend them! I have just realised that I have not emailed you to say "thank you". The cake topper arrived a day after you said it would and it was absolutely perfect, it sat high and proud on the cake absolutely perfectly and everyone absolutely loved it. It will now sit treasured in our house for all time, we trying to find a box to mount it in or something to protect it..
We cannot thank you enough for the end product, it is excellent. We were extremely impressed with the work these guys did. 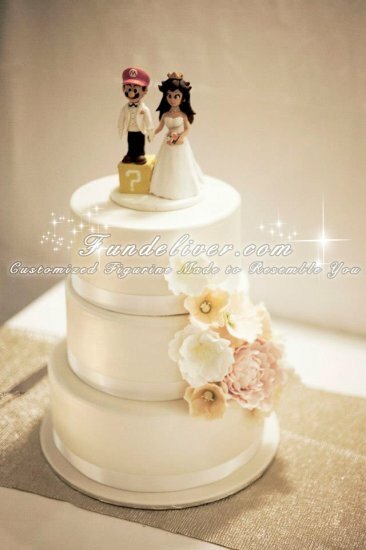 We used ours beside our cake (only because we bought the groom's cake topper before we found this site). They were very easy to work with. They take you through every step of the way. I asked for several revisions and they did what we asked each time. I highly recommend these guys!! 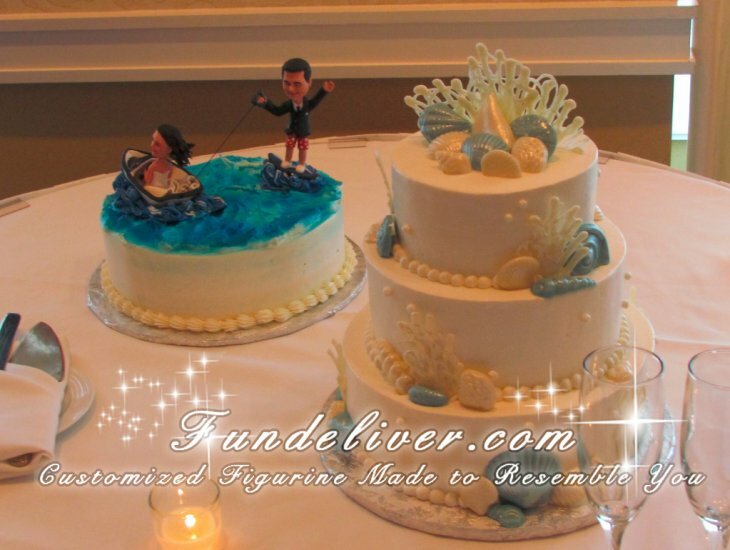 We had MANY, MANY compliments on our figurines. Several of our guests wanted one of their own. The price is a little high but we felt it was well worth it. I now have our "mini mes" on my desk at work. It is something we will cherish forever! Thank you! !